Employers in the UAE are looking to invest in tech-savvy talent that is capable of adapting to positions and managing tasks that might not even exist right now, new research has revealed. Gavin Anderson, the British Council's director for the UAE, said that the impact of technological change on dynamic global markets, like the UAE, makes it important for individuals to learn new skills throughout their life to remain competitive in a modern economy. "In short, skills that are critical are those that can be moved between industries, and are typically those that include science, technology, engineering, and mathematics (Stem) related subjects," he explained. As the UAE economy grows, experts note that more jobs will be opening up across six sectors including: Energy and petrochemicals; travel, tourism and hospitality; Manufacturing; Trade and logistics; Financial services; and technology, media and communications. Highly skilled workers will be increasingly in demand across these six sectors in the coming years. "But what the research has shown too, is that core skills, like communication and teamwork are also key; we have seen how important communication and language skills are, especially in a hub economy like the UAE," Anderson said. The British Council's 'Future skills: Supporting the UAEs future workforce' report noted that while the rising tide of artificial intelligence (AI) and automation has sparked fears of a jobless future, there will be lots for humans to do in the coming years. "So long as we accept that change is a constant theme and our attitudes towards working practices develop, then we should embrace the benefits of automated processes. Employees should be given the chance for life long training, to adapt and anticipate where they can contribute value to new industries and working environments," Anderson pointed out. "Over 75 per cent of business leaders are telling us that technology has already impacted on the way they operate. We were also told that the skills developed in engineering, such as those you'd expect in the energy sector, can easily be moved towards developing industries, such as renewables, solar and other sustainables." 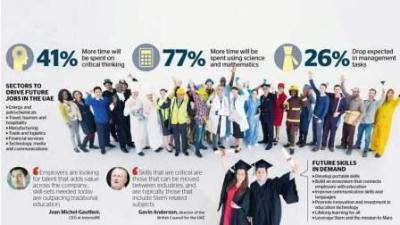 According to the new report, in future workplaces, 41 per cent more time will be spent on critical thinking, 77 per cent more time will be spent using science and mathematics skills, and management will go down by 26 per cent. Experts say that proactively approaching this new tech-driven world is especially important for countries like the UAE where there is a clear, and ambitious focus on diversifying the economy away from dependence on oil and gas and driving towards a more sustainable knowledge-based, tech enabled future. Jean Michel-Gautheir, CEO at InternsME, noted that there is a huge shift happening in the way people hire. "Employers are opting for more creative ways to source talent," he said. For example, he said some of the most innovative companies are using interactive job applications that are closer to their vacancies in practise and real-world scenarios. "Employers are looking for talent that adds value across the company. Technology and the skill-sets needed today are outpacing traditional education. These new methods are pushing job seekers to be more creative and equip themselves with unique or alternative skills - essentially, upskilling of their own accord in preparation for the future's evolved jobs." Ibrahim Seksek, COO of ZenHRAs, added that employers are more and more in need of candidates, who can keep up with the ever-growing technological requirements in the workplace. "Automation is one of the top trends that is taking the HR world by storm," he said. "This means that owning a computer doesn't necessarily mean that you're tech-savvy; there are actually a number of skills that you need to master if you want to advance your career. Those skills include, but are not limited to: Internet research skills, mastering enterprise systems, and document formatting skills. Graduates can take advantage of a variety of free online resources to help them develop the needed skills employers are currently looking for," Seksek said.